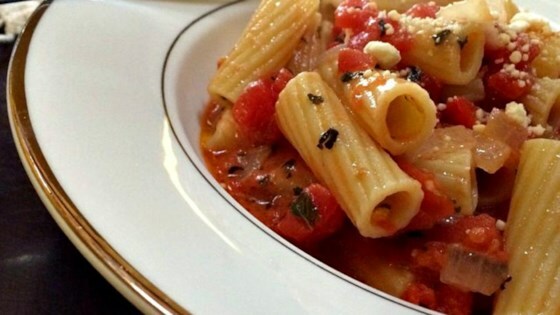 "Creamy red sauce seasoned Italian-style with garlic, basil, and oregano." Heat olive oil in a saucepan over medium heat. Cook and stir garlic in hot oil until fragrant, about 1 minute; add vodka, bring to a simmer, and cook until mostly evaporated, about 10 minutes. Stir tomatoes, basil, sugar, oregano, salt, and pepper with the garlic and vodka in the saucepan; bring to a boil and cook until most of the liquid evaporates, about 5 minutes. Remove saucepan from heat. Stir milk and butter together in a bowl until smooth; pour into tomato sauce and stir until the color is even. Place saucepan over medium-low heat, bring sauce to a simmer, and cook until slightly thickened, about 5 minutes. Very simple and easy to cook. However seems a little bland. I had to put much more salt. Also the proportion seems good for 3 servings, not 8 servings as the recipe suggested. Used fresh tomatoes and served over zucchinni pasta. Added a pinch of chili flakes for added zip. Loved it! I put a small handful of shredded mozzarella cheese in it, while the milk thickened the sauce. This was delicious with linguine! I added jumbo shrimp (that I bought frozen and were deveined and raw) that I boiled with bay leaves, onion, sliced lemon, salt and a half a bottle of beer.